Best laid plans of mice and men…. I had hoped that I would be able to bring the readers of this column in "Dancer" an overview of a running of an English Highland Competition (bit of an oxymoron in itself) however the fates were unkind. I made the mistake of a fast food breakfast at London's Heathrow airport, and ended up flat on my back for two days with food poisoning. To add insult to injury when I finally had the strength to call Heathrow about the problem, the Day Duty Officer informed me, "Well madam you really should have complained at the time". If I had known the food was tainted I probably would have, however I just thought it was a bad case of airport food! Nevertheless, the world of Highland didn't stop in my absence and others have had more successful travels, although not by plane. 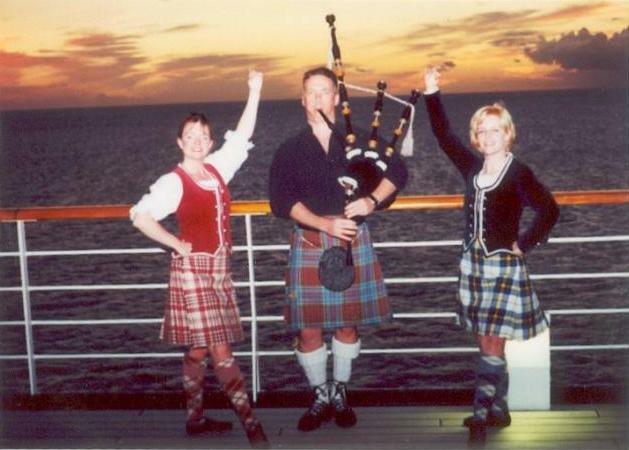 "Scotland Goes to Sea" for the past six years Highland Dancer Joan Bys has performed the dances of her heritage aboard Holland America's five star ship MS Veendam. For the past three years Tori Taggart, a name familiar to readers, has joined Joan and singers Peter Morrison, The Alexander Brothers and The Brigadoons as well as a Scottish comedian and pianist David Smith and Piper Neil Anderson. Joan writes, "East of Hebrides Entertainment (run by Bill and Karen Reid of Philadelphia) have put on "Scotland Goes to Sea" for the past six years. Every night the dancers and piper warm up the crowd for that evening's singer. Champion Highland Dancer Tori Taggart ad myself share the dancing. We each get a night or two of solo performances, and then we get together for a few nights to do duets. We have come up with variations of the Sean Truibhas, ½ Tulloch and Blue Bonnets. As Tori lives in South Carolina, and I live in California, we don't choreograph the dances until we are on the ship. Tori and I each prepare solo choreographies for the cruise. This is most enjoyable, in that we get to depart from the regular competition attire and steps. The whole purpose, at this point is to entertain the audience, and not worry so much about where your foot is on your leg. One of the most challenging things about dancing on a cruise ship is that it moves. There have been several times that Tori and I have leapt, and the floor is not where we left it when we came down. We have experienced other challenges as well. The first few cruises were on the princess Line. The Sun Princess has a baby grand piano that is raised up from under the floor of the stage and is bolted down. Once the show is in progress the piano stays put. The only choice I had was to do the Fling, up against the piano, so that when I turned, my elbows hit. I, for one have learned a lot from working with Scottish legends Peter Morrison, David Smith, The Alexander Brothers and the consummate professionals, The Brigadoons. Highland Dancers sometimes have a hard time understanding the difference between a show and a competition. By watching the other entertainers, I have been able to focus on the audience's enjoyment rather than concentrating so completely on my own positions. I think it's helped me overcome that "robotic" look we sometimes get on the competition platform. I've also learned that the show must go on, no matter what condition the stage, lighting or music is in. Things that we complain about at a competition, simply must be forgotten when you're there for the audiences total enjoyment." Dancers would be nowhere without music, something that Piper Neil Anderson of the cruise would certainly agree with I am sure. I am not sure what difficulties he experiences; hopefully he has his feet planted firmly on the moving floor. Piping for Dancers is not as easy as those pipers at competitions make it look. I asked Dancer Piper, Adjudicator and teacher of dance and pipes, Bill Weaver for some of his thoughts on the subject of piping for dancers. "I'm often asked whether I prefer to judge Highland dancing competitions or pipe for them. Actually, I like doing both equally well, which is good because it seems that half the time I'm asked to pipe and the other half I am asked to judge. Both are very tiring. Piping obviously is physically tiring where as judging is mentally tiring. This article is about piping for Highland dancing competitions. Over the years I have been asked numerous questions regarding piping for dancing and this article is an attempt to address some of those questions. In what way is piping for dancers different and why can't the average piper from a pipe band pipe for dancers? I think the biggest difference between piping for dancers and piping in a competition, whether it is solo or with a pipe band, is that there is a different focus. In competitive piping the focus is on execution and expression. Tempo is assumed to be steady and, for the most part, the tempo is fairly steady, with small, unintentional variations occurring throughout the tunes being presented. When piping for Highland dancing, the focus is on maintaining a very steady tempo that is danceable, with expression and execution being slightly less important. Dancing pipers run the gamut from absolutely terrible to excellent pipers. In my opinion, the better the piper is or was as a competitor, the better he/she will be for dancers, too. Part of the job of the dance piper is to inspire the dancers to want to dance. To do that, the piper has to be able to express the tunes in a way that makes you want to tap your foot. Pipers that are still in the early stages of their careers aren't as able to do that; often because they don't have command of the tunes they are playing. In other words, less experienced pipers are working just to get through the tunes, let alone make them sound danceable. What should an organizer of a competition look for in dance piper? In addition to the above qualities, the piper should be open to outside direction and suggestion. We all are taught that the dancer must dance to the piper. That assumes, however, that the piper's tempos are within acceptable parameters. Even the best piper in the world isn't necessarily a good dance piper if he/she plays so fast the dancers can't express themselves because they are expending all their energy just trying to keep up. A great piper who isn't willing to alter his tempos when asked is no better than a beginner who can barely get through the tune. Ultimately, it is up to the judge to set the tempo. Quite often the tempos are fine and don't need to be adjusted, but when the tempo is too fast or too slow, the judge should tell the piper who should then make the required adjustment. Because of that, the piper should watch the judge or judges to be sure the tempo is all right. It is also very helpful if the piper knows not only the tunes, but also the actual dances he/she is piping for. That way if there is a problem, the piper is able to get back on the tune at the proper place in the dance with as little disruption for the dancers as possible. When should organizers think of hiring two pipers? Generally, if the organizer feels the need to hire two judges, they should also hire a second piper. That number is generally considered to be right around 100 dancers. 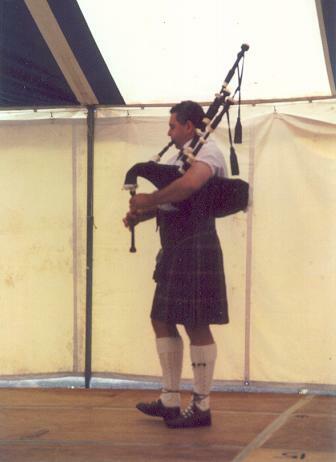 Some pipers have a connection to dancers who also compete. They may be the piper's student or daughter or the student of the piper's wife or daughter. Because of this, there is always some "question" along the lines of "Oh, he plays to suit his student or wife's student or daughter". How would you answer that? I suppose it could be done if the piper's student was up in the very first group because the first group is where the tempo is set. However, you need to remember that it is ultimately up to the judge to set the tempo, and I always ask if the tempo is acceptable after I play for the first group. Once the first group is done and the judge has set the tempo, all the dancers must dance at that tempo, like it or not. Actually, when people make accusations like that I think it's amusing and a little sad. I don't even use pre-recorded music when I teach. Unfortunately, for my students, they have to listen to me sing at every lesson. I'm always being asked by my own dancing students, "can you speed the next step up a little or slow it down?" I rarely get the tempo just the way they like it, so at a competition my chances of piping the perfect tempo for my own students is highly unlikely. I basically have a tempo in mind for each dance that I feel would be comfortable to dance to and play at that tempo. While playing for the first group, I watch the judge in case they are trying to get my attention to speed up or slow down. I also watch the dancers to get an idea if they are struggling to keep up or working too hard to slow down and I alter the tempo accordingly. After the first group is done I ask the judge is the tempo is all right. If the judge likes it, I play that tempo over and over until all the groups are done. If the judge doesn't like it, I adjust to his or her specifications. In some Championships in Canada they are having the pipers pipe to a Metronome. Does that help in the overall scheme of things? It is good, as far as setting a level playing field for all competitors. The tempo is set before the competition even begins by the organizer, so the piper is just doing what he is told to do. That way, you are sure that everyone is dancing to exactly the same tempo. The only problem with playing with a metronome is that it is difficult to do especially if you haven't done it much previous to the competition. I think most pipers are surprised to find that they don't actually play as steady a tempo as they thought they did. Because the piper is concentrating so hard on staying with the metronome, there is very little expression, or lift to the music, which tends to make the music less danceable. Are there some misconceptions regarding being a piper for dancers that you would like to address? I'm not sure that I'm aware of anything other than people often think you don't have to be a very good piper to play for dancers. I think the opposite is true; you have to be fairly proficient to play for dancers at a level the premier dancer appreciates. What would the dance piper like to see from the organizers of outdoor Competitions? The thing that always annoys me is that the judges are always taken care of in terms of water, shade and even a chair to sit on. The piper is often forgotten when it comes to these things. It's the middle of July and the competition is held in the center of a field with no trees. The judges are brought water, asked if they would like an umbrella put up to shade them from the sun and the piper is left standing there dying of thirst and nearly passing out from heat stroke after playing for and hour and a half straight. So I would like to see the organizer take as good care of the piper as they tend to do for the judges. Do you feel the tempo is slower in North America as compared to parts of Australia/NZ and, if so, why do you think that is happening? Yes, I think the tempo in North America tends to be slower than it is in parts of Australia and New Zealand. In my opinion, the reason for this is that they still dance they way we used to dance in the 50's and 60's. At that time dance tempos were quicker than they are now. That's not to say that we are right and they are wrong, just that our tempos have tended to slow over the years and theirs haven't so much." My last weekend in England found me at the local mall buying presents. The entertainment that day, although very good, happened to be a version of "Stomp". Unfortunately, the acoustics in the mall did not make it a pleasant experience, so grabbing my purchases I made a beeline for the exit. Thinking I was still experiencing a "ringing" in my ears it took a moment to realize I was actually hearing the bag pipes, which in turn led me to more Scottish dancing on the cobble stones. Next month my continuing adventure with highland and things Scottish in England!